According to Louise Erekson, this quilt was given to her mother, Myrtle Greer, by the Relief Society in appreciation for her having served as Relief Society president. Embroidered on the squares are the names of 24 women who were members or former members of the Aurora Branch and/or friends and neighbors of Myrtle Greer. When was it made? The current best guess is between June 1948 and December 1951. June 1948 because that’s when Georgia Howard married Raymond Lang, and her married name is included. And 1951 because Cora Hall passed away that year, and we believe would not have been included after she died. Living in Aurora was not, however, a requirement. Several women named on the quilt had moved away. We assume that someone wrote and asked them to send their signatures. 1. Nancy McCarty, daughter of Ward and Ardis Young McCarty who moved to Aurora from Utah in the 1940s. Her father was the manager of the Montgomery Ward store on Broadway and served as second counselor in the branch. 3. Patsy Ward was the daughter of Ilda Fuller who lived across the street from the Greers on Harrison Avenue. Pat later married and had three sons. Her husband passed away after 50 years of marriage. Remarried now, Pat and her husband divide their time between her home in Indiana and his in Georgia. Pat Ward Smith is the sister of Jack and Gladys Sullivan. 4. 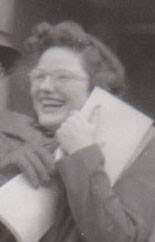 Mae McHugh was the sister of Lizzie Sutton, who was Myrtle Greer’s childhood friend. They went to school together in Tunnel Hill, Illinois. Mae was not a member of the branch. If you know when the quilt was made or can share any information about it, please let us know. Emily's quilt. Amazing that you have so much information of each of these people. Yes,Emily's quilt is also a treasure. For those who don't know about this baby quilt, it has the embroidered signatures of the women in her family (on both sides) going back to her great-grandmothers. 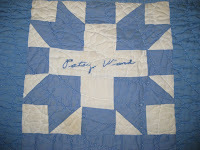 For those women who had passed away, I found their signatures on letters or documents and enlarged them for the quilt. 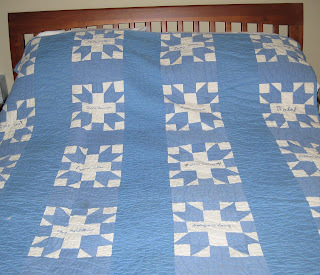 Grandma Greer's signature quilt was a model for Emily's. They have different patchwork patterns, but share the signatures of dear ones. Thanks, Cathy, for your comment.